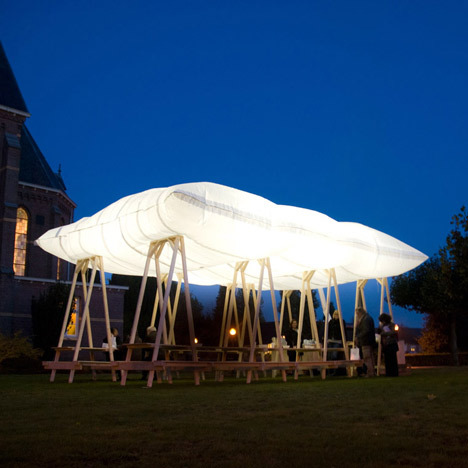 This inflatable pillow on stilts is a picnic pavilion designed by Netherlands design studio Overtreders W.
Called The Roof That Goes Up in Smoke, the inflatable roof is filled with hot air heated by a wood stove, the centrepiece of the pavilion, and provides shelter for the bar and picnic tables below. The roof is illuminated at night, providing light for the picnickers heating their food on the stove. The mobile pavilion can house up to 40 people. It was created for Allerzielen.nu, an event celebrating the festival of All Souls Day, and was installed at three locations. For Allerzielen.nu, an event to celebrate All soul’s day, Dutch design studio Overtreders W designed a mobile outdoor pavilion. The pavilion, a meeting place for sharing food and stories, was called “Het dak dat opgaat in rook” (the roof that goes up in smoke). It consists of two large picnic tables, a floating roof that provides shelter for the tables and a wood stove. The roof is blown up and lifted with hot air. The wood stove heating up the air is also the centre piece of the pavilion, to be used for making hot chocolate, roast chestnuts, pumpkin soup or jacket potatoes. The pavilion sits up to 40 people, and lights their picnic in the dark autumn night. The pavilion was designed for Allerzielen.nu, an event inspired by the concept Allerzielen Alom from the artist Ida van der Lee. It was installed in three different locations in the south of Holland: at a graveyard in Roosendaal, at an institution for mental health in Biezenmortel and at a graveyard in Breda.